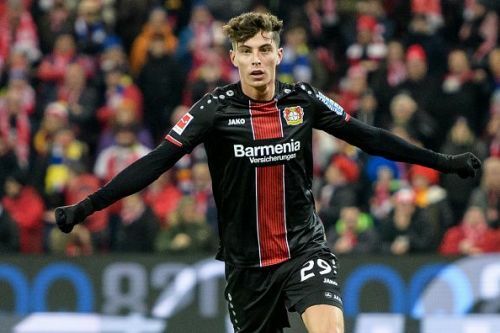 Kai Havertz is regarded as one of the brightest young talents in Germany and a future star for the German national team. At just 19 years of age, the Bayer Leverkusen midfielder has already featured in over 75 Bundesliga games. He is the youngest ever debutant in the league for the German club. According to the German press, he has the potential to follow the footsteps of former Leverkusen products such as Michael Ballack, Bernd Schneider, Toni Kroos and Carsten Ramelow. He had also been profiled as the next Ballack by the official Bundesliga website. Havertz is considered as an Alleskonner - a German word for a player who can do everything due to his ability to play in any midfield position. The 19-year-old can operate as an attacking midfielder, a central midfielder or even as a deep-lying midfielder. However, his true potential can be seen when he is deployed as a central attacking midfielder. In Bayer’s preferred 4-2-3-1 formation, he is positioned in the center of the three advanced midfielders in front of a double pivot alongside Leon Bailey and Julian Brandt. Both Bailey and Brandt like to operate in the half spaces as inverted wingers, therefore, giving Havertz the freedom to roam in the spaces left in between the lines. Havertz possesses wonderful vision and great passing abilities, and his decision making in the final third is always wonderful. He has the closest style of play to Mesut Özil when it comes to his creativity and vision, whereas his excellent use of physical power and shooting is what makes many to compare him to Ballack, a Bayer Leverkusen’s legend, who had the combination of both. His creativity in the final third mainly comes from his awareness and his ability to find spaces. He mostly waits for the right opportunity before threading the final pass, something which shows his maturity and game intelligence. He is a master of playing through balls as he constantly finds the runs made by Bailey, Brandt, who tend to move a lot without the ball. His dribbling and first touch are not the best but his brilliant technical ability mostly helps him in this area of the game. His awareness and receiving technique makes him to excellently evade pressure situations, while he can also use quick one-touch passes to get away from tight spaces. For someone with ‘not that great’ close control operating in between the lines, he uses his imperfect first touch to his advantage as he usually uses his second touch to dribble past players, therefore, creating space for himself. His ability to protect the ball in those tight spaces also makes him confident under pressure. 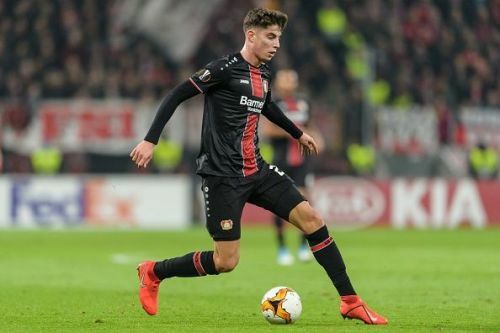 Apart from his ability to split open defensive structures with his passing, Havertz is also a dangerous offensive player. His tendency to make late runs into the opposition box or finding spaces around the box when defenders’ concentration is on the striker, constantly gets him into golden zones. He is Leverkusen's leading goalscorer in the Bundesliga this season with a total of 9 goals, despite being deployed as a play-maker. He also has 3 goals in the Europa league. His 2.5 shots per game also show that his attributes are not only limited to play-making but also providing a direct threat in front of goal. Havertz has no distinct weaknesses to his game, although he has room for improvement when it comes to his defensive work. His defensive numbers, especially when played as a deeper midfielder, are low compared to other deep-lying midfielders. 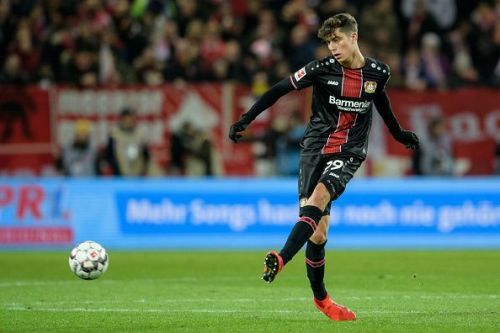 Havertz has the potential to be one of the best attacking midfielders and there isn’t any doubt that he will be pulling the strings for one of Europe’s elites any time soon. Liverpool once invited the young German international to Melwood to strengthen their position to land one of the most sought after young players in world football.